According to OIA (Outdoor Industry Association), snowshoeing participation has experienced a tremendous increase (40.7%) since 2008. This can be attributed to the ease, fun, versatile and inexpensive nature of this activity alongside its health benefits. In addition, the advanced technology in outdoor gears has resulted in a vast collection of snowshoeing gear and equipment – poles, snowshoes, footwear etc. which has led to increased comfort while in its pursuit. However, the difference between a miserable snowshoeing adventure and a memorable one doesn’t lie in it being fun and easy but rather in your gear choice, more so the footwear. Match your activity style, whether backpacking, running, climbing or just walking with quality boots that will keep you warm and dry without being too bulky. So, what are the best boots for snow snowshoeing? In this read, we’ll help you sort that out by providing you with buying guidelines and the top picks in the market today. How to select a snowshoeing boot? Stressed by the overwhelming boots variety? The reality is, you can slip into any pair of boots and hit snowy trails – be it, your old pairs with their worn out threads or new ones. But to ensure an enjoyable, warm and dry snowshoe experience, it’s advisable to don footwear having the following features and properties. As a rule of thumb, the stiffer the lug sole the better as it’ll help minimize the amount of energy expended when snowshoeing. How? With a stiff sole, you don’t have to spend energy flexing the boot inside the bindings but will rather focus your vigor on moving forward. It’s also advisable to go for rubber-bottomed boots as the rubber not only offer a 100% water protection benefits but also result in an easy boot cleaning and drying processes. Moreover, rubber soles do boost the durability of the boot. Therefore, if you’ll be wandering a lot in the mud and snow e.g. when doing construction work, purchase a boot with a rubber bottom. When wandering through deep snow, mud or worse, wet snow; don’t settle for water resistant boots but rather go for waterproof pairs. This means purchasing boots with Gore Tex, Climafit, eVent, MemBrain lining (or their equivalent). Going for pairs coated with Durable Water Repellant, spays or waxes can help but they are not reliable. Remember, if your boots soak through, they’ll be wet and your feet will be in for a chilling and a soggy experience. In addition, based on how vigorous your activity will be; sweating is bound to happen. If allowed to accumulate, the sweat vapor can dampen your footwear rendering your feet uncomfortable. To avoid this, go for breathable boots – pairs with Gore Tex membrane are the best. A proper fit is a critical feature when it comes to your footwear. To avoid having painful blisters and a tedious experience, ensure that your feet don’t slip up and down or move side-to-side as you snowshoe. Nonetheless, it’s advisable to purchase a ½ or full size larger pairs to accommodate layers of insulating socks. Avoid tight boots as the can restrict circulation resulting in cold toes. The boot’s lacing system is a key consideration too as it influences its fit and ease of use. Go for systems that meet both conditions (i.e. are easy to use and result in a proper fit). In addition, ensure your snowshoeing boots have a visible protrusion/notch on the back where the snowshoe binding heel strap can rest to prevent its frequent slip off when snow sliding. Avoid high heel spikes and cowboy boots, they’re poor snowshoeing boot choices following their rounded hell parts. Snow skating is a highly aerobic exercise that produces lots of heat and any extra insulation like that available in winter boots may not be required. However, the weather is bound to change or rather you’ll require that warmth in extreme conditions. It’s, therefore, advisable to go for boots with a toasty insulation layer to keep cold at bay. According to experts, Thinsulate insulation is warmer when compared to others and thus can save on weight as not much of it is required. In case you decide to wear running shoes, hiking boots or any other non-insulated footwear, purchase and wrap a pair of neoprene cover around the boot for additional warmth lest risk having cold feet. Snowshoe bindings should have a secure and tight fit for a fun and comfortable adventure. Cinching the bidding heel straps tightly help achieve this, but it also exerts significant pressure on the upper part of your footwear. Therefore, if the top of your boot is compressible over the arch/instep; it can impede circulation resulting in chilled toes. Leather uppers are more durable, more resistant to abrasion and compression as compared to synthetic and nylon ones. However, they take long to dry. Nylon uppers dry faster, are warmer but less durable. Whichever upper fabric you go for, ensure it’s sturdy and waterproof for a memorable adventure. Depending on your activity, you can end up wandering in deep snow. In such a scenario, as a rule of thumb; the higher the pairs are, the better. Thanks to their design, most snow boots extend past the ankle to prevent both snow and cold from getting into the boot. 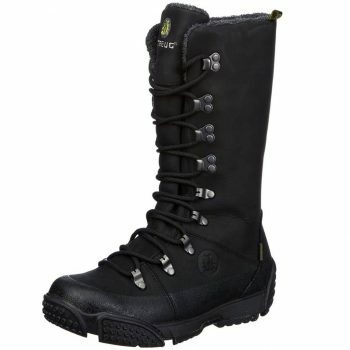 They’re recommended when snowshoeing in deep snowy trails as they help keep your feet warm. A perfect snowshoeing boot should incorporate a snow gaiter in its design. It’s a barrier constructed into the boot to prevent snow and consequently water, once the snow melts from running down inside the boot resulting in wet and soggy feet. Gaiters are available in two forms: built-in and pull-up gator. The former consists of a layer of insulation that snugs tightly up against the leg closing snow entry into the boot. A pair having this type of gaiter is easier to slip in following the design and works well in most snow conditions, but not when dealing with deep snow. Pull-up gator consists of waterproof fabrics that can be wrapped tightly against the leg by tightening their drawstrings. Once you put on the boot, pull up the gator and tighten the drawcords around your leg. Much as it can be tedious to use, it’s indispensable when it comes to keeping any snow out. Most snowshoeing boots come with a temperature rating. Use the table below to select a suitable temperature rating based on the weather condition when snowshoeing, your temperature tolerance, the activity’s duration and how vigorous you’ll be. For example, if you normally have cold feet; purchase boots in the advanced cold or all-round cold category. If you’ll be outside for longer durations, go for extreme or advanced cold categories. If you’ll be vigorous while snowshoeing, you can go for an all-round category and so on. Get the lightest boot as possible. Don’t negate that advantage from high-tech and Ultralight snowshoes by donning heavy footwear with them. If you find snowshoeing boots too bulky and cumbersome, try a layering concept. A light system that’s adaptable to various conditions and use. E.g. a thin polypropylene inner socks followed by neoprene socks, light hiking boot or running shoes, a stretchy neoprene bootie and lastly a super gaiter. The number of layers will depend on the duration, intensity and the day’s weather condition. A good pair of snowshoeing boot is critical for a fun experience. It should keep you dry, warm and stable without being cumbersome. It should be compatible with snowshoes too. Remember, everyone is different; with varying blood flow patterns, metabolic rates, resistance to cold and body mass. Therefore, pick a boot that best suits you following the considerations outlined above. Regardless of your snowshoeing style (walking, running, climbing or backpacking), there is a boot out there for you. Are you open to recommendations? Here are the experts’ top picks that are totally worth your while. Your pooch doesn’t give a damn if it snowed overnight _the black lab still needs that hiking adventure_ and the driveway won’t shovel itself. What do you do? 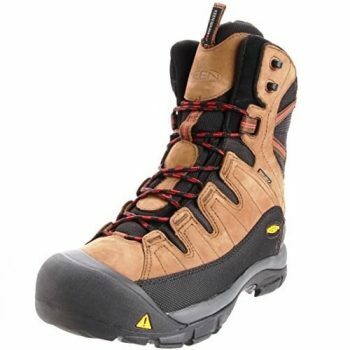 Just lace up KEEN Summit Winter Boot and shovel the deck. Your feet are guaranteed to remain dry and warm with KEEN DRY lining and KEEN WARM insulation. The Nubuck leather upper result in rugged longevity while the compression-molded EVA midsole, thermal shield footbed and shellback heel support cushion the feet in ergonomic comfort. In addition, with the lining being breathable; you’re assured that no sweat accumulation will take place despite the activity being highly aerobic. Moreover, if the deck gets sleeky and you acquire a melt-freeze cycle; you’ll still be stable thanks to this bombproof boot’s rugged rubber outsole. 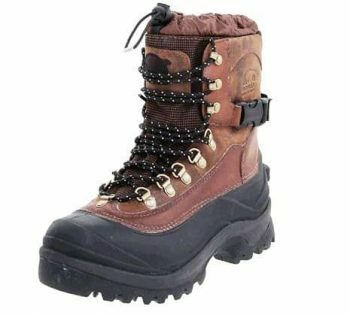 Deep snow pursuits call for an inferno of warmth like that within this waterproof Sorel Men’s Conquest Boot. Just slip on this for your next snowshoeing trip and be ready to be dumbstruck by the Achilles supportive straps, lightweight, and indestructible build, not to mention 400g insulation standing between you and the bitter chills outside. Plowing through deep drifts at full speed? Don’t worry as the rubber multi-direction lug keeps you surefooted while the integrated gaiter draws tight locking out snow. The EVA inserts and footbed provide the necessary cushion for a comfortable adventure while the barrel lock closure ensures a secure fit. In addition, Nubuck leather being incompressible and resistant to abrasion; prevents any impediment to circulation which may result to cold toes while boosting the durability of the boot. With the snow half boot deep, just slip on Sorel pair and enjoy the ride. Snow has all the hiking trails covered? Don’t pack in the couch, watch too much TV and endless snacking rather, enjoy the mountains with a little support from Salomon Men’s X Snow Boot. This insulated and waterproof pair contains all the required ingredients to tackle whatever a snowy trail may dish out. Behind it’s Nubuck leather, is Climashield waterproof and breathable membrane to keep off water from melted snow and condensed sweat vapor. Its Thinsulate insulation provides adequate warmth regardless of the temperature. To ensure the durability of the pair, the toe and heel are reinforced with rubber caps, and the outsole is a rugged ice grip rubber lug to provide indispensable traction on sleeky surfaces. For comfort purposes, the boot is equipped with an Ortholite insole, breathable textile lining, and a molded shank midsole. In addition, the lace-up closure ensures a tight fit which consequently prevents painful blisters occurrence. Unsure of what you’ll be stomping through? 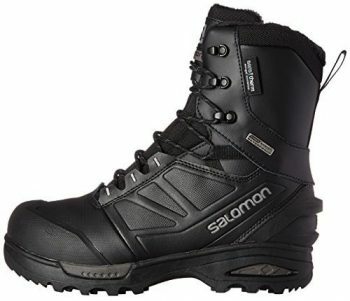 Just slip on Salomon’s boot and be surefooted. How do you adapt to wintry conditions? Is it by getting used to chilled feet? This shouldn’t be the case! 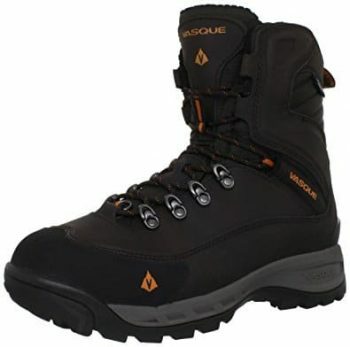 Try Vasque Urban Snow Boot for a change. They’re equipped with 400g 3M Thinsulate insulation to keep your feet warm and toasty on frosty days. The waterproof leather and textile upper material and the ultra dry waterproofing system combine to keep off the melt while the fleece collar lining provides the so-needed comfort. Its Perpetuum last is crafted on a straighter line making it ideal for individuals with flatter feet. 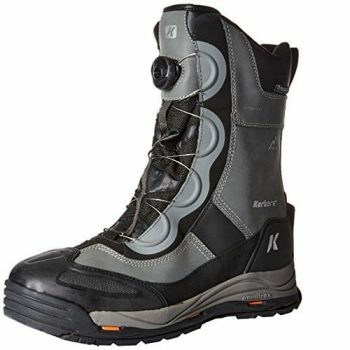 In addition, the boot contains a D-ring gaiter that locks the snow out for warm and dry feet. As the days shorten, the snowy mountain beckons even more loudly. Answer their call with these boots for a memorable snowshoeing experience. 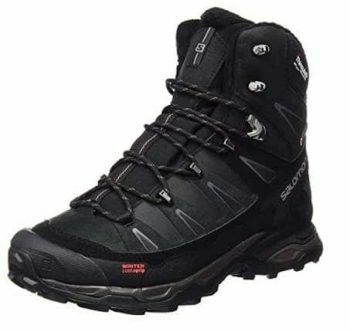 This Korkers IceJack Snow Boot don’t compromise; they’ve adaptable traction for stable performance on sleeky icy and snowy surfaces thanks to their Omnitrax 3.0 interchangeable outsoles. Their 100% waterproof construction (waterproof/breathable bootie and seam-sealed waterproof leather, stitching, and webbing) help keep your feet dry. 600g insulation provides ultimate warmth even during less aerobic wilderness activities. The low profile speed lacing system ensures a quick on/off wear and a custom fit. In addition, the 360° rand offers superior support without foregoing flexibility. Going ice fishing this winter? Korkers boot has you covered. Have fun in the elements by slipping on this Icebug Eir-L Snow Boot. It’s ideal for active women as it helps keep them warm and dry regardless of the prevailing weather condition. The pair is naturally durable, warm and comfortable following its leather upper for water protection. Its fleece lining wicks off moisture for a dry feel. EVA midsoles and removable Ortholite footbed offer superior support while the rubber outsole provides ground-gripping traction even on sleeky grounds. From shoveling the driveway to hiking through snowy trails, this Salomon Toundra Snow Boot has you covered. In fact, the winter never sees it coming. It’s highly supportive and protective featuring Salomon breathable, waterproof Climashield membrane to protect you from fresh snowfall. The aerogels insulation ensures adequate warmth with temperatures as low as -40F. Its synthetic fur lining feels soft when rubbed against the skin preventing possible occurrence of painful blisters. Underfoot, this pair features a molded EVA midsole that provides the required cushion for a comfortable adventure and an ice grip rubber sole for maximum traction. When following the Appalachian Trail, slip on this pair and create a memorable experience. Despite the cold, this boot is the rhythm that keeps your icy and snowy routine in the pocket. With a full-grain upper, a waterproof thermoplastic rubber lower, and a 100% waterproof construction; The North Face Chilkat Boots keep water and snow from creeping in & freezing your feet. Its PrimaLoft insulation provides ultimate warmth regardless of the prevailing weather condition. You will be sure-footed thanks to the Icepick lugs and TNF Winter grip sole that adapt to the changing ground surface conditions providing maximum traction. In for a long day? Don’t panic as the northotic footbed and EVA midsole provides adequate cushioning and support. 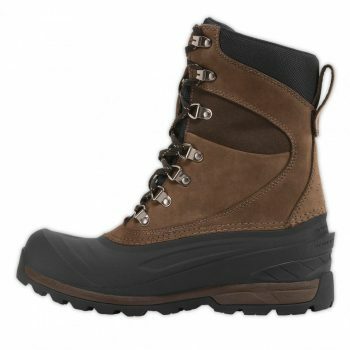 Whatever wilderness activity you put your mind into, be sure to get support from this North Face boot. There you have it! An in-depth review of the top-rated boots for snowshoeing. They are tested and proved to be of high quality and thus, purpose to check them out. If lucky you can find a pair that suits your needs and if not you’ll have a clear guideline on how to go about selecting the right pair – a win-win situation. Don’t let the overwhelming variety of snowshoeing boots hinder you from acquiring the perfect pair. Yes, it can be tedious carrying out an intensive research and comparison among many brands but it’s all worth it. Better yet, you can acquire the best pair by following the buying tips outlined above. Researching not your thing? Just check out the recommended pair, you’re bound to find a brand that suits you. Which is your best snowshoeing boot? Why is it your favorite? Give your feedback in the comment section below.